Playing Super Mario Cart in multi-player mode is among the most competitive and addicting driving video games ever. But when you’re driving or racing (legally) in the real world, you’re not likely dropping banana peels behind your car to ward off tailgaters. Nor are you likely to get shrunk to the size of a Matchbox car by a magical bolt of lightning. The most realistic driving video games ever released on different gaming platforms. Atari brought the virtual driving experience out of the arcade and into your basement. While Pole Position is simple and repetitive, it set the stage for the evolution of video game racing. The game throws sharp curves and competing cars at your open wheel racer. Best of all, it convinced a generation of wannabe tween drivers that they could already dominate on the real roadways, leading to failed driving tests and sky-high car insurance rates. Before energy drinks sponsored rides, drivers were actually fined for exchanging in post-race fisticuffs. NASCAR existed as a simple escape from reality for the nation’s 99-percenters. And if these folks didn’t attend the actual storied racetrack, then they could stop by their local arcade with a fistful of quarters to get their own Daytona experience. Daytona USA was one of the first games that simulated real driving, with a wheel, pedals, a stick shift and even a restrictor plate hot-glued to the back. Wait — that was just a giant wad of gum. Anyways, Daytona USA allowed for two-wide action with multiple players and crude 3-D rendered tracks. It was almost cooler than borrowing your parents’ station wagon for a joy ride around the cul de sac. Almost. Haven’t heard of Ayrton Senna? He’s one of the top Formula One drivers, ever. The Brazilian driver was killed in an accident in the 1994 San Marino Grand Prix. This game is now an afterthought of his legacy, and is widely believed to be the best racing game for the Sega platform. Acclaimed for its “realistic physics,” the cartridge was assisted by Senna’s input on everything from track design to cover art. The storied driver is pictured in a sharp bowtie celebrating the victory. And if you have a Sega Master System, Game Gear or Mega Drive lying dusty in the corner, you too can visit victory lane while paying homage to one of the sport’s forgotten champions. Gran Turismo was towed from the arcade to the living room, dorm room and man cave. The transition marked a dramatic leap forward for how closely the virtual behind-the-wheel experience could simulate the real-world experience. Gran Turismo 3: A-Spec was the total package, with more than 150 cars, 80 races and 20 licensed tracks. The game also brought several special effects to the table to ante up the realism, such as reflections and sun glare. So be sure to wear your shades. Playing any Grand Theft Auto game is like looking in the rear-view mirror. Who are you? Are you the one who completes the challenges and achieves the goals of these wildly engrossing, open world action-adventure games? Or are you the one who simply runs around carjacking strangers, harassing police and living out your sociopathic fantasies? We’re not here to judge. While Grand Theft doesn’t always offer the most realistic driving gameplay – you can usually walk away after launching your vehicle off the top tier of a parking garage – the vastness of the interactive world extends far beyond the shoulder of the road. And the little details, be it behind the wheel of a car, crane or watercraft, drive home a different sense of reality. That’s why Grand Theft Auto V made $1 billion in just three days. The game is available for PlayStation 4, Xbox One, PlayStation 3, Xbox 360 and Microsoft Windows. 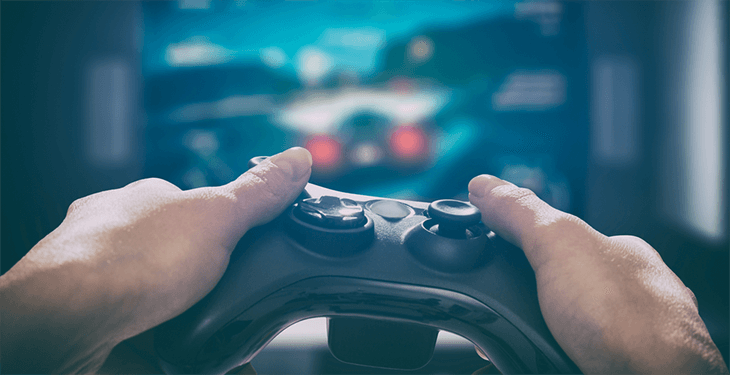 We don’t suggest that video games are a suitable substitute for driver’s education classes or driving lessons with mom and dad. But these games offer a down-to-earth perspective on driving, racing, and the rules of the road – with a little fun mixed in.